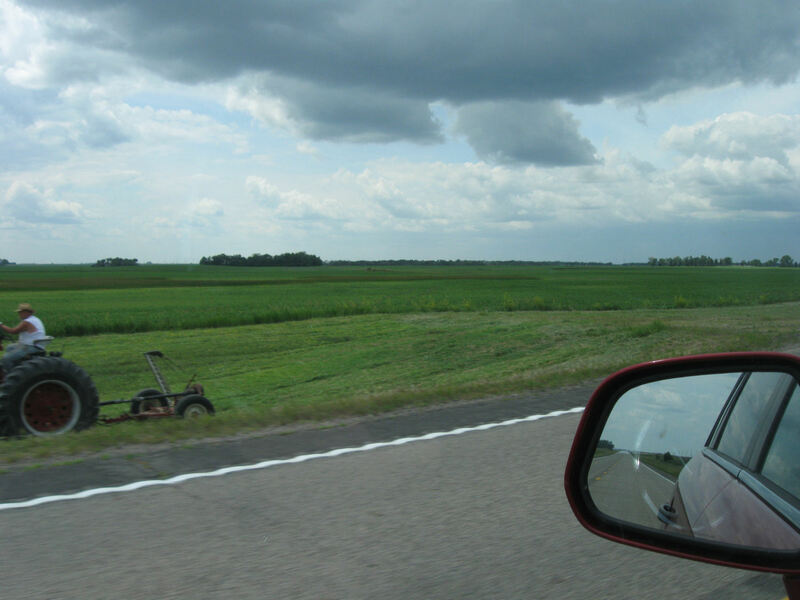 2014 Road Trip Photos #23: North Dakota Flatland Interlude « Midlife Crisis Crossover! 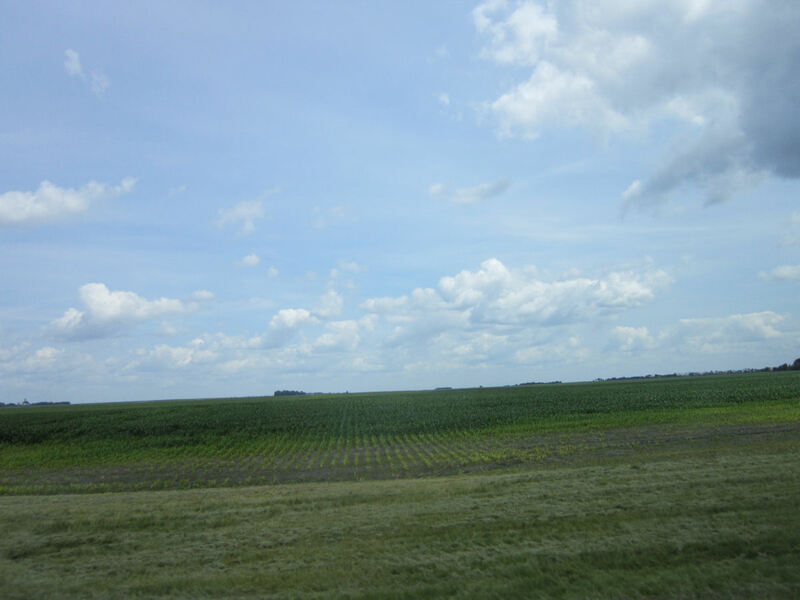 You know you’re truly on a road trip through the most peaceful parts of the American heartland when you can take photos while you’re driving without frightening your spouse to death. We realized during the planning stages that Day Five would have some of the longest, potentially least exciting driving stretches of the entire trip. 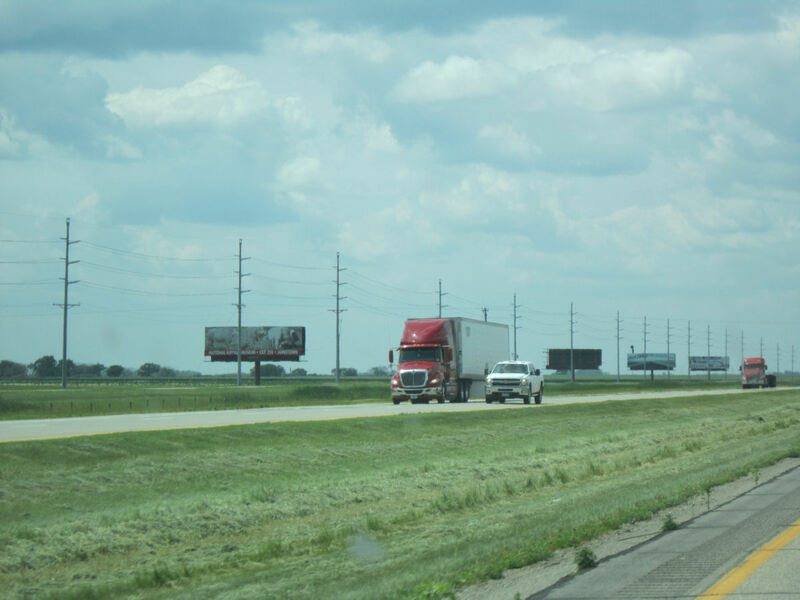 We’d already spent four hours on the road from the Twin Cities to Fargo before lunch, but we had another destination on the afternoon itinerary, some ninety minutes further still. 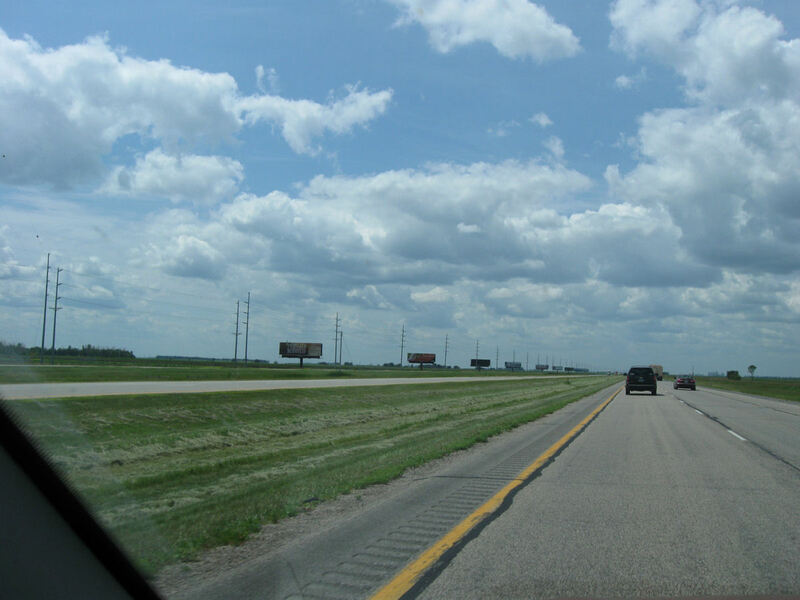 We’d seen the beautiful sights of South Dakota on our 2009 road trip, but this was our first time stepping into its upper twin. Both were granted statehood on the same day in 1889, but the parts we saw didn’t look much alike. The next leg of our trip looked mostly like this. Lots and lots of this. Hit the open road! Into the great wide open! Head out on the highway! This year we cut our road trip from nine days down to seven, due to a combination of financial and work-related factors. One of the more lamentable consequences is the North Dakota leg was reduced from an in-depth exploration to an afternoon/overnight hop. 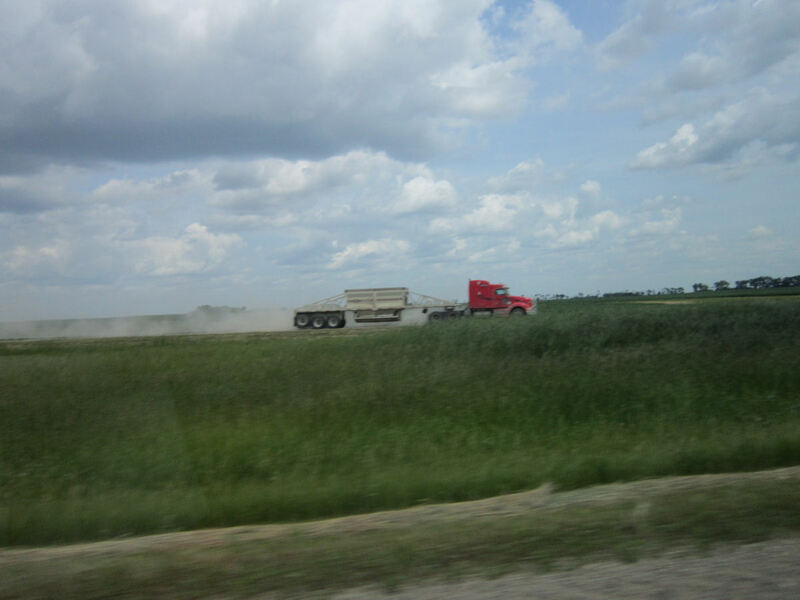 We would later return to Fargo in the evening and poke around a bit, but according to our research, all the coolest North Dakota sights are in or around Bismarck, which was beyond the scope of our day. 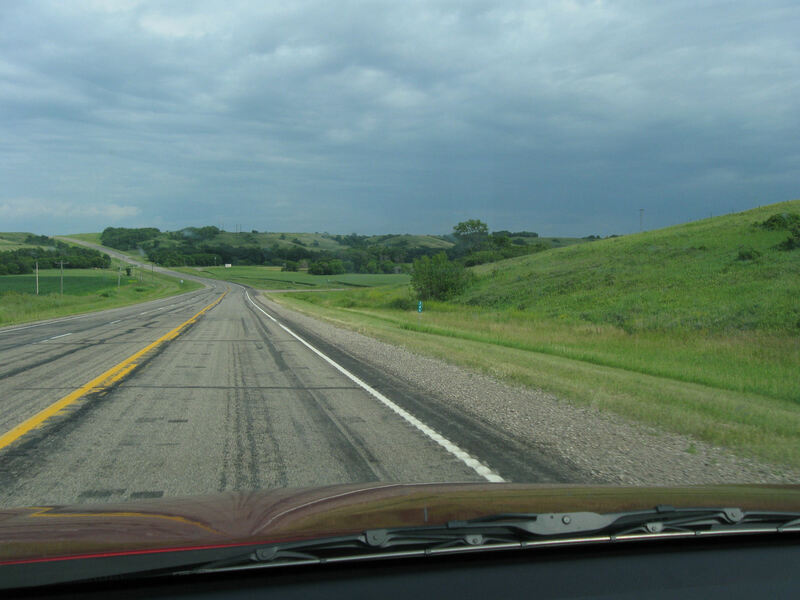 This is the road to Bismarck, but we could only take it so far. Cars. Billboards. Cars. Billboards. Cars. Billboards. Cars. Billboards. Cars. Billboards. Cars. Billboards. And so on. Granted, this is the part of our journeys that airline travelers rejoice in skipping. Not every moment of our time is bedazzling. Sometimes you need a combination of patience, imagination, and good companionship to keep you sane through the not-so-showy parts of life on the road. Sometimes there are, like, no cars going the opposite direction. It’s just billboards, billboards, billboards, sky, grass, billboards, billboards, billboards. And you’re all like, WHO TOOK ALL THE CARS? And then you know the boredom is getting to you and turning you into a car-bound Tom Hanks from Cast Away but with air conditioning. When those little things come along to shake off the doldrums and block your view of the endless horizon, you try to savor them for all the seconds you can. In a moment where you thought you’d scream if you saw just one more fluffy cloud, it’s that one thingamajig that makes a difference and casts its own kind of light into your mental darkness. Other times, all you’re looking at is picturesque farmland #10,000,000,005 in a series, and you’re cranky because you know you can see the first 10,000,000,004 just by doing laps around your own hometown. Welcome to Dances with Green Acres on the Prairie! But what’s this? Rough weather ahead? Ominous thunderheads building in the distance, preparing a full-scale ambush? A threat of gale forces and lightning and hail and flying livestock? And you’re driving straight for this certain doom? Or at least a serious disturbance? Would you believe a noisy inconvenience? A really early version of the Bruckheimer Films logo, back when they only made films about chess clubs and shoe repair. …and then the darkness fades, the clouds go back to Threat Level Sleepmaster, and you realize you’ve been had. There is no rain. There is only road. The long and not-winding road. Where the streets have no game. Highway to bleah. 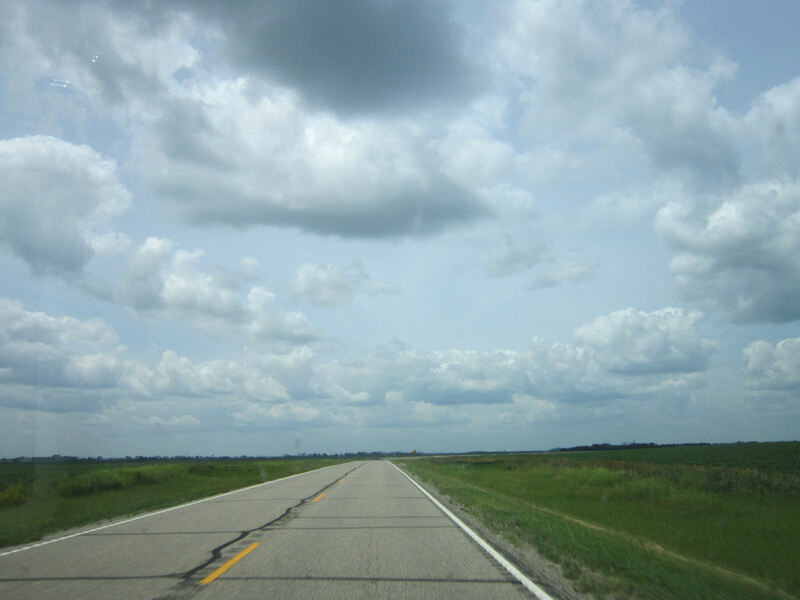 Leaving the interstate for rural highways can be slightly more engaging. 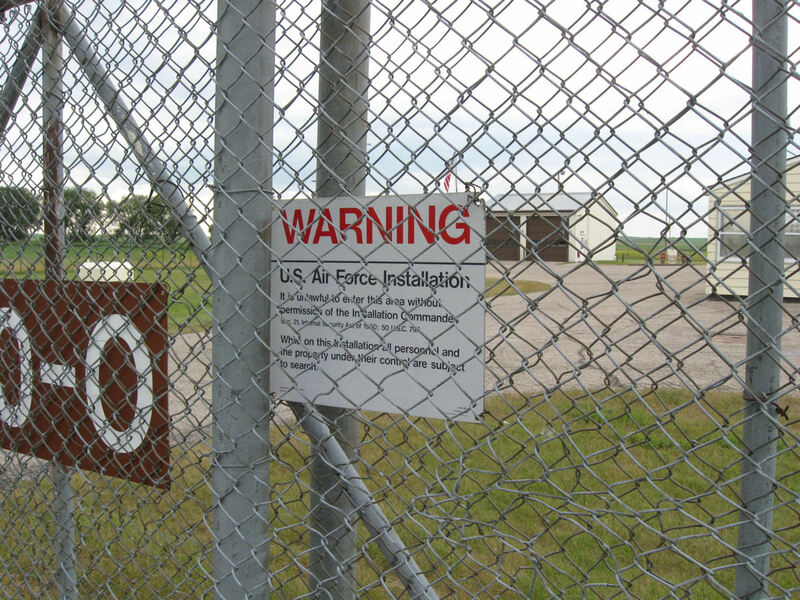 Maybe you’ll see farm animals, or a deer will ram your car, or there’ll be a rustic truck stop that catches your eye, or some farm equipment so massive that it looks like cool military hardware. Or it’ll just be semis kicking up a lot of dust. This shot is a thousand times cooler if you pretend the truck’s driver is one of them Duke boys, makin’ a getaway from that consarned Boss Hogg. Three or four Rhode Islands later, hours after your 4G connection vanished, the directions end and you reach where you meant to be all along, just when you thought you couldn’t take the open road anymore and were thiiis close to renouncing these trips forever and never ever leaving home again except maybe for conventions or groceries or work, in that order.